(Bottom) Alain Parent, David Deschenes. 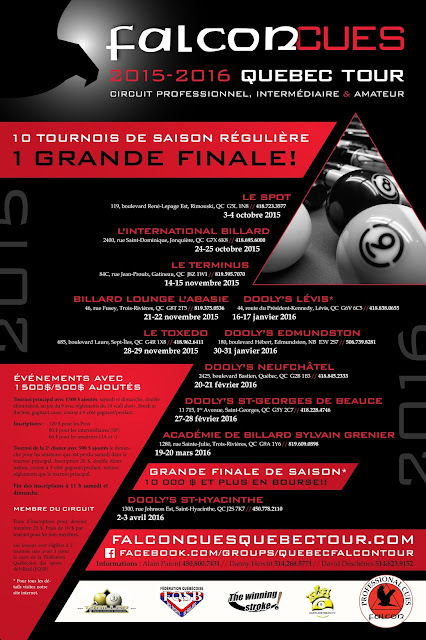 This past weekend at Le Spot Billard in Rimouski, the inaugural stop for the newly minted Falcon Cues Pro Tour got underway. For those not familiar with Rimouski it is where one of our biggest national exports Sidney Crosby played his junior hockey for the Rimouski Oceanic. This tour is the brain child of co-founders Danny Hewitt, Alain Parent and David Deschenes. When asked why they felt the need for this tour Parent said, "We were badly missing good tournaments in Québec, mainly in the Pro and Semi-Pro divisions. I contacted them first. Falcon thought we would be a good start for them in their re-branding adventure throughout Canada. They sponsored a cue worth between $800-$1000 for each of the 11 tour stops." The news of this tour was met with great excitement by the top talent in Quebec. Alain Martel, Danny Hewitt, Francis Crevier, and many others have committed to appearing at each stop. This was demonstrated this past weekend as 34 players were in attendance for this event many who traveled several hours from the Montreal area. In the first round there was no real upsets to talk about as all the tournament favourites charged on to the second round. In a 34 player tournament the big names could not avoid each other very long as there were several key match-ups in the second round. 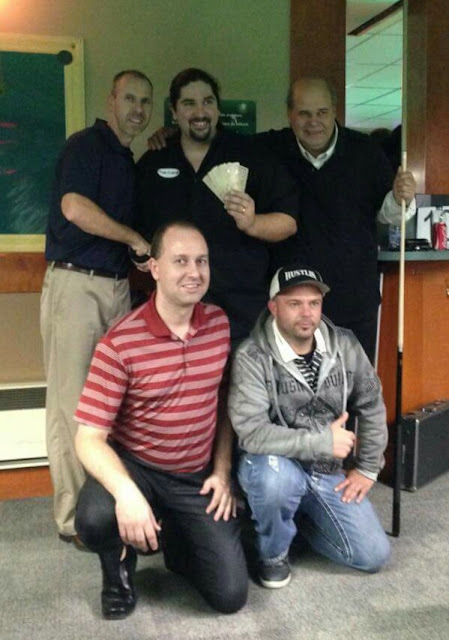 Danny Hewitt got by Martin Daigle in a tight match 9-7, while Alain Parent dispatched Sylvain Grenier 9-3. Other notable scores in this round were Jeff Blais 9 vs. Dany Nguyen 3 and Yan Lalande beating recent Canadian representative at the World Championships Tom Theriault 9-8. Long time Canadian professional and national legend Alain Martel appeared to be in form for this event. Martel charged through the winners side of the bracket making it all the way to the winners side final with notable wins over Crevier, and Fred Lapointe. On the second day of this event Martel returned to play Hewitt and lost 9-6 and then lost his rematch against Crevier in the losers side final 9-2. After suffering his only loss of the tournament to Martel, Crevier went on a tear on the losers side. He eliminated many top contenders along the way such as Grenier, Daigle and Lapointe. This set the stage for a very interesting final against Hewitt who many believe is the current #1 player in Quebec. However these two talents have combined to have some very impressive wins against top players such as Johnny Archer, Thorsten Hohmann, Erik Hjorleifson and John Morra all in the last year. In this final however it was all Crevier as he dominated this match to win 11-1 to become the first winner on the Falcon Tour. I would like to congratulate Francis Crevier for adding another title to his collection. 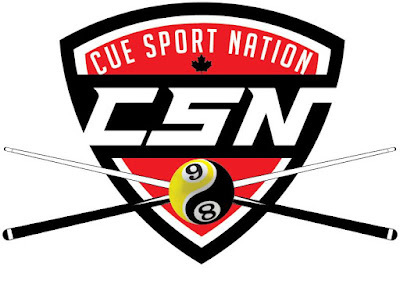 I would also like to congratulate the organizers of this tour, who are bringing Canadians its first Pro Tour in nearly a decade since the abrupt end of the Canadian 9 Ball Tour. There is finally some light at the end of the tunnel for professional pool in Canada. I have full faith that this circuit will grow in the coming years as they have the "right" people behind the scenes and lots of support. For more information I invite you to visit their website http://www.falconcuesquebectour.com/ or their Facebook page https://www.facebook.com/groups/QuebecFalconTour/ .